- Suitable for Live wire working & Household applications. GEDORE has a complete range of VDE Insulated Tools. - Set includes 8 1/4"/210mm long nose pliers. - 6 1/4"/160mm diagonal cutting pliers. - 7 1/4"/185mm combination pliers. - Bi-material grips insulate against electrical shock to 1000 volts. 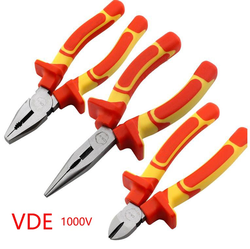 In order to meet the demands of our patrons, we are indulged in offering VDE Tools. We are offeringStanleyVde Combination Pliers to our clients.